Often we can simply intuit some of the principles of Vastu. In the morning, which direction do you face to greet the sun? The direction of light, enlightenment and inspiration. 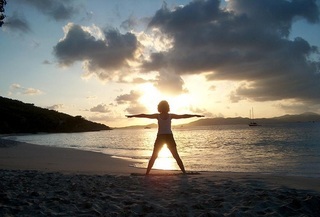 In yoga, surya namaskar (sun salutations) is a universal practice. It is believed that the best rays of the sun come just before dawn, an ideal time to practice yoga for maximum rejuvenation. Vastu directs that the rays of the sun should filter into a building during the morning when sunlight is neither too bright nor too hot. However, by understanding Vastu’s basic principles of the directions and the elements on the Vastu Purusha Mandala, more beneficial changes will occur. Michael Mastro, Seattle based architect and expert on the art and science of Vastu Shastra, says, “The house is a blueprint of your life.” If there is a missing Southeast corner in the home, for example, Mastro can tell almost instantly that the person is having trouble with their energy level. Diabetes or other health problems that are related to pitta (one of the three doshas in Ayurveda) may be occurring. Similarly, Vastu says that if the Southwest corner is given over to a child’s bedroom, the child will rule the home. The Mastros had that exact problem years ago with their daughter. As Mastro studied Vastu at the encouragement of Maharaji Mahesh Yogi, he and his wife, Robin, took the Southwest corner as their bedroom when they moved into a new home and the problem was solved in about six months. Vastu addresses other common considerations besides who has control over the home or workplace relative to their space assignment on the Vastu Purusha Mandala. Questions about finances, health, relationships and career are those most frequently asked, says Mastro, who designed the first Microsoft office building in Kirkland, Washington. He did this without ever revealing he was using principles of Vastu. Today, many of his clients are young Indian Microsoft millionaires looking for homes, and their family members may have mentioned they should find someone with knowledge of Vastu to pick the appropriate house that’s going to have a good influence on their life. Michael Borden, however, is quick to point out that some problems can’t be solved, because a client may not be willing or able to make the changes recommended. These changes may involve cutting down a tree that is blocking the free flow of energy into their home from the North or moving the swimming pool from the Southeast, the abode of the element of fire. And then there is the problem of improper orientation of the house when it was built. Borden looks at the floor plan in relationship to the cardinal points of the compass. If the building is twisted, he believes it’s almost impossible to apply the principles. He does, however, assess in a very informal way, how people feel about their home. There is often disharmony created by mental activity if residents are worried about something in the home. Urban apartment dwellers can apply the Vastu Purusha Mandala to their spaces, including individual rooms, and if they can’t exchange the bedroom location with the kitchen to put the space into proper orientation, she helps them work with what is there. That means making sure the center of a room is empty space and possibly placing a carpet there as well as honoring nature, both in the home or workspace. Cox emphasizes choosing organic over synthetic, for example. She has also seen that the presence of plants in children’s rooms lowers their stress level and calms them down. The shape of the table we eat at or meet at influences our behavior, too; there is faster energy in circular patterns so if the table is round, then the meal or meeting will be quick, but if it is rectangular it will be slower and calmer. The environment is all that is, and we are inseparable from it. According to the Vedas, all vibrations of the universe are innately in perfect order and harmony, and if disturbed, they will result in chaos and disharmony. Even when we practice asana, pranayama and meditation diligently through yoga practice and care for our bodies and minds according to Ayurveda, all still may not be well in our lives. It is possible that the missing piece of the puzzle might be Vastu Shastra. The center of the Vastu Purusha Mandala is always left empty, creating what is called the Brahmasthan. The Brahmasthan is the energy heart and lung of the house, and it should always be left open and free of obstructing elements. It is also best if this portion is in direct contact with the Earth and climate permitting, open to the sky so that the energetic space surrounding the Earth is attracted into the house. That’s why we see courtyards in the center of Indian homes and Indian temple design; the original examples of Vastu Shastra, forbids the actual use of the central space. The intermediate directions occupy the corners of the rectangle; for example, Northeast is the corner between North and East. Each intermediate direction has a corresponding element: Northwest and air; Northeast and water; Southwest and earth; Southeast and fire. Space, of course, is in the center. Specific Vedic deities are also assigned to the cardinal and intermediate directions. For example, the north belongs to Soma, the lord of health and the southeast belongs to the deity, Agni. Agni symbolizes the sacred fire and so the southeast quadrant acts as a purifier. Vastu probably predates the Vedas, going back as far as 7,000 years. The Vedas, considered to have no beginning and no end as well as no authorship, were vibrations from the universe picked up by the rishis (sages), the only mortals who had attained enough spiritual enlightenment that they could hear the pure vibrations of the universe. This is when the first oral transmission of vibrational qualities is thought to have occurred. The primal sound AUM, or OM as it is more commonly known, is what we today identify as our connection to the distant beginnings of the manifestation of sound on the planet. There is no real yoga class that does not invoke OM as part of the teachings and practices and means nothing less than the essence of the Supreme Creator, the coexisting breath of the Paramaatma, Brahman. Early on, the rishis had identified the five elements of space, air, water, fire and earth. Here, we are considering thousands of years of contemplation on the nature of existence, neither possible nor probable in the environment in which we live today. Yes, space was discerned as a subtle energy and dynamic element out of which all objects of nature come into existence and ultimately into which all disappear. The rishis also determined that there is a higher Self (having heard the sounds of the universe, what would you expect?). In Hinduism this higher Self is referred to as ‘Brahma’ and there is ample mythology surrounding how Brahma first manifested. It may be metaphor, as is the case in every sacred scripture, but even today Brahma is used to denote the universal Self within all of us. The interconnectedness of all that is, “Tat Tvam Asi,” is a fundamental concept of all Vedic disciplines: Yoga, Ayurveda, Vastu, Jyotish (astrology), dance, art and music. Vastu actively considers how it is possible to bring Brahma to form. And, the first Vastu structures were Indian temples in which the intention was to realize and honor the universal Self on a physical plane. A lofty goal, to be sure, for what we today call architecture. The rishis also figured out that everything that exists is animated, alive, due to vibrational qualities. Even today scientists are still playing around with whether water molecules have specific vibrations. Wouldn’t this also apply to buildings? They exist, don’t they? If that is the case, then why not create dwellings that are perfect in terms of universal vibrations and which manifest all the aspects of the universe, based on the Supreme Self, the rising and setting of the sun, the influence of the planets and the aspects of the various deities? Think back to a time when you walked into a room and immediately felt something was wrong. Or maybe you’ve had the experience of working in an office where no one could get along, or you or your co-workers were always getting sick. The ancient science of Vastu Shastra tells us that it might not be you that’s out of whack; it may be your space. Vastu means “dwelling, site or existence” and Shastra means “science.” Vastu Shastra is often referred to as the original green architecture. It can be esoteric, complicated, detailed, rigid and rule-driven. It can involve hard-to-understand grids and attributes of Vedic deities. Or it can be a sort of common-sense approach to designing space according to natural laws of nature. And, according to some, there’s a lot of superstition involved. All may actually be true. Today, we all acknowledge that we have our own biorhythms and energy patterns. In Vastu, every building is considered to be a living organism possessing its own energy patterns or vibrations. The science of Vastu seeks to harmonize these patterns or energies so that the inner space of an individual and the outer space of the cosmos are in balance. On a very basic level, Vastu provides the means to adjust the vibrational frequencies within our homes and workplaces making it more likely we’ll find balance and harmony within them.